Compass software is now Compass for Simple Western. Just like it did before, it analyzes Simple Western™ Size or Charge assay data and processes the results for you. And it's got all the 21 CFR Part 11 compliance tools you need with the new Compass Authorization Server v2.1 (more details below). Quantitative analysis for each protein or isoform is done automatically so you can truly be hands-free. Data can be displayed in a lane view, graph view, or as a digital capillary image. Want to share your results and transfer your assay? No problem. Compass for Simple Western Software's export feature makes this as easy as a click of a button. NEW: High Dynamic Range (HDR) Detection Profile. This new feature expands the dynamic range 100 times in Wes thanks to a more effective algorithm to create the High Dynamic Range multi-image analysis, refresh substrate from the assay plate prior to each exposure (requires an updated embedded). For Peggy Sue, Sally Sue and NanoPro 1000 only the improved algorithm is implemented, which will still result in an improvement of the dynamic range. More details here. NEW: Wes lets you save even more sample. With v4.0 you can load only 3 µL of sample/well, a 40% reduction when you can't afford to waste precious samples. More details here. Support for the Low Molecular Weight assays. Reports: Export reports as .pdf files. Choose from a list that includes plate layout, sample peaks, images and much more. Multiple Exposure View: A new Graph Option, it overlays all the chemiluminescence exposure times acquired for a particular run and can be used to spot potential signal burnout. Lane Contrast Tool: Now part of the Analysis Settings, it can be locked to customer-defined white and black levels. Once saved, the lane contrast setting can be exported and applied to other assays or runs. 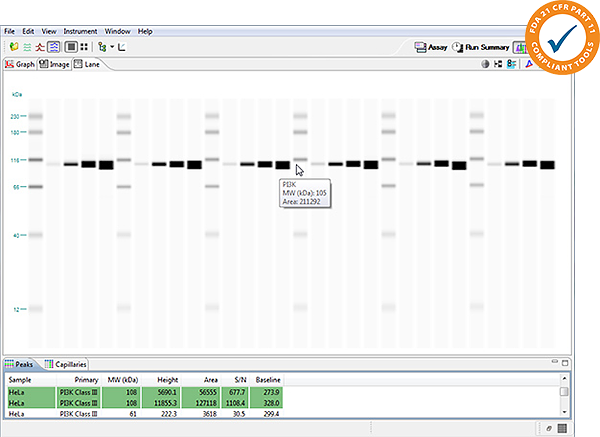 Proteins are displayed as bands in a lane view similar to what you would see in a traditional Western. Rolling over a band will reveal its protein-specific information. Molecular weight and other relevant data are reported in a concise data table that you can easily export. 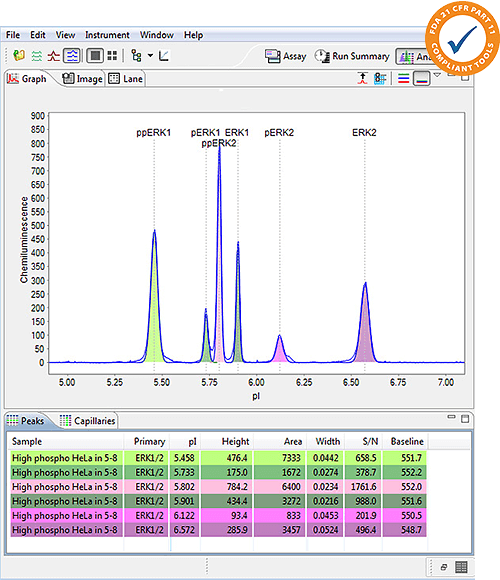 Proteins can also be displayed as an electropherogram in graph view and data for multiple samples can be overlaid. Peaks are automatically defined by name or pI. Rolling over the peak will reveal its protein-specific information. Quantitative distributions of detected isoforms are reported. NEW: Password policy settings control multiple aspects of password requirements including days valid, required characters, number of login attempts, length, and previous passwords to compare to. NEW: The default admin user is now a member of a new Administrator group and can log in to Compass. NEW: Audit Trail records all Authorization Server events including successful and failed log in attempts. NEW: Includes support for Windows logins using the LDAP interface. NEW: Database has added encryption.